Item Description: Volanta coffee table’s expansive top entertains a crowd, while caster-fitted legs let you roll it to any spot. 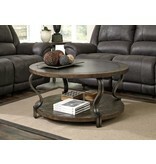 Multiple finishes, including antiqued pewter and warm veneers comprise the round two-tier shape and curving legs. 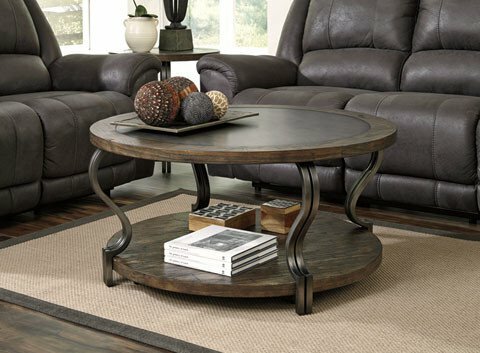 Series Features: Made with select pine veneers and pine solids in a caramel brown finish. Transitionally styled metal legs in a shapely form finished in a durable antique pewter metal tone. Inset metallic top finished in matching antique pewter finish. Cocktail table has casters for mobility.